See the video, reach the article by NBC News. A story about truck drivers and dogs that need a lift. 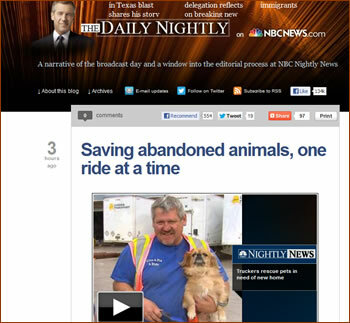 Mark Potter, NBC News reports about a group of volunteer truck drivers and an organization named Operation Roger . 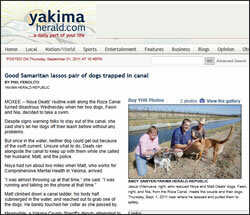 . . Truckers Pet Transport, where pet loving truck drivers, men and women, help needy pets. As you can see from the video and the article written by Erika Angulo, Producer, NBC News, it is so good to hear about a successful effort to find permanent loving homes for dogs in need of people. This amazing rescue story comes from Hope For Paws, a non-profit animal rescue organization, based in Los Angeles, California. Hope For Paws rescues dogs and all other animals who are suffering on the streets and in the shelters. They foster these animals in homes, cage free, until they can find them permanent, loving families. They can use our support.